Monday 11th May. 2’6” and rising along with a near gale blowing down the Temple didn’t make for easy fishing. Edward Evans and pals here for three days so they got stuck into it. The only action was in the Cauld where Ian had a hold of something decent for a few seconds on the fly, by lunchtime the water was rising as was the wind so the lads decided not to bother fishing this afternoon. It’s been a rotten 8 or 9 days with wind and water levels up and down, dry tomorrow but going to be windy again. Tuesday 12th May Another day when the wind blew a hoolie down the river so the decision not to fish was made for us, along with the colour. 3’2” and 50 degs this morning. 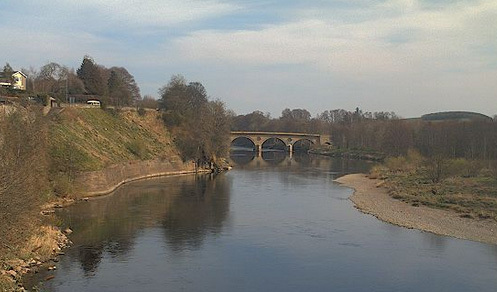 There were fish caught above Kelso but only one below the Teviot at Upper Hendersyde. Forecast is for a quieter day tomorrow, I really hope so as this wind and water is becoming a bit of a bore, and if it carries on I’ll have nothing but the garden to write about ! 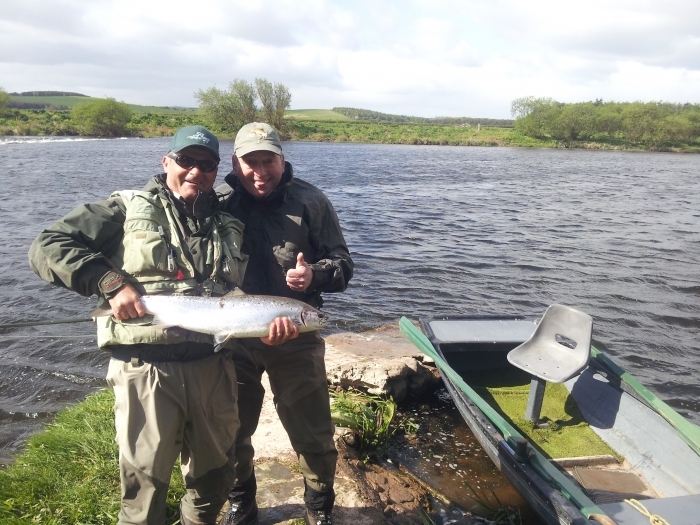 Wednesday 13th May That was a better day on the river apart from a much improved catch overall, we got two at the Lees which are the first for May and about time. 2’3” and 50 degs, dark beery water and best of all, no bloody wind. Edward Evans was the lucky rod getting both fish from the tail of the Cauld on a black and yellow tube. Ian had a pull in the Temple which resulted in a 5-6lb Seatrout jumping out of the water a few seconds later. There were fish seen splashing in the lower Cauld this afternoon so many that Robert Baxter’s dog “Ellie” had to swim round the whole pool to investigate what was going on, putting paid to the old story that if you swim your dog through the pool it brings them on! Hopefully the river will keep dropping so we can spread round the beat. Thursday 14th May What’s going on? Fish all over the place in the Cauld this morning, Paul and Steven Jeffries gave it everything but not a pull was had, the fish were mostly on the small side but who would complain. There were more fish showing this morning than we’ve seen since September/October but by lunchtime they were gone, so someone upstream is going to have a good day tomorrow. 2’0” and 48 degs this morning with a strong beery hue, a cold easterly wind blowing it was more like November. The weather is to change to the west tomorrow so it would be great if it warmed up, it’s been a long cold spring, still only seen the one clutch of ducklings. Disaster in the garden there is a hole in my netting which I didn’t notice but the Sparrows did so my beetroot have been munched back to bare stalks, you feed them all winter and that’s the thanks you get. Friday 15th May The middle of May and it’s cold and windy more like October. 1’10” and 48 degs with a beery tinge. I rowed Eric Bell down through the Cauld a couple of times with a #6 dressed treble on a sink tip followed by a Sunray and we managed a boil at the Sunray, apart from a couple of fish in the Slap that was it. After lunch Steven and Paul went into the Cauld and saw fish running through but no action, Bob Jewels just round the corner on the Little Temple had 3 maybe as they were corralled into a narrow stream made the difference. Further down the beat we did the back of the wall down through the Glide but never saw a fish. Yesterday’s fish must have ended up at Upper Floors as Colin Bell told me he’d had 5 licers by lunchtime, so they are still shooting through. It’ll be better tomorrow apart from the wind. 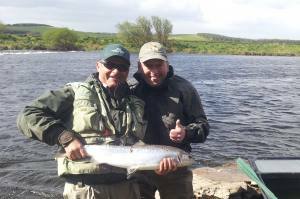 Saturday 16th May 1’9” and 50 degs slight beery tinge and the first two members of the German international fly fishing team are with us today the rest to follow next week. Carsten was into the Slap boat with Paul quicker than a rat up a drain pipe and on his third cast was into a fish, there was only one drama during the fight when the shank of the net snapped before Paul got it netted but a quick run to the hut and a new net was to hand. A nice 10lb fish was unhooked and returned. Peter fished his way down through the back of the wall and through the Glide and into Duddo but never had a touch. 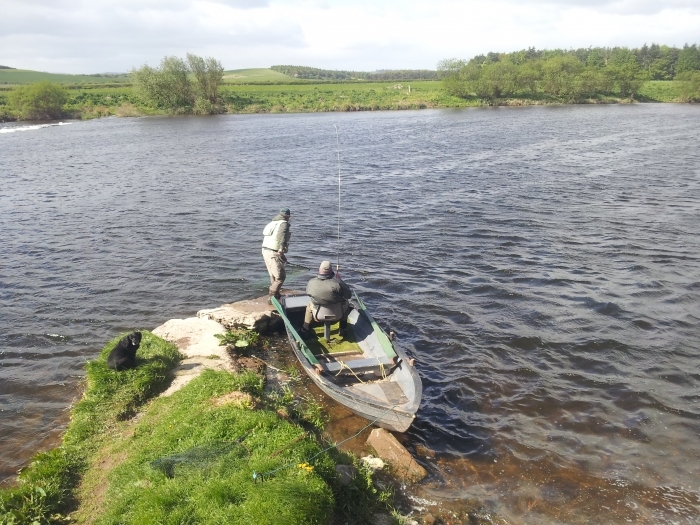 By lunchtime the wind was really blowing making the casting for Peter in the Cauld boat a piece of cake, not so easy for the man on the oars though. We did see one nice fish in the Cauld but couldn’t interest it, if it was still there to interest. There were some nice trout rising this morning in the Glide but as I had a strimmer with me and not my Trout rod I didn’t try for them. I have yet to see another clutch of ducklings apart from the one at Learmouth last week, normally there would be families of ducks all over the place by now. There’s a bit of rain about tomorrow and the forecast for next week is unsettled with showers and a bloody wind. Junction was blank this morning but ended up with 5 for the day so they are still scooting through, Kevin from Milne Graden reports two fish today so some below as well which is encouraging. Photos this week are of Paul and Carsten getting the fish from the Slap.